You probably wonder why there is such a post if Dublin is known for its bad weather with a lot of rain and wind, but trust me, we also have sunny days here. 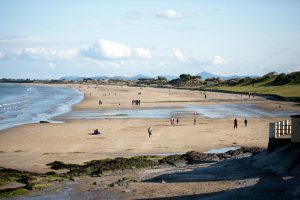 We also have some gorgeous beaches around Dublin which you can visit to spend a day out at the beach, to go for a walk or even to do some kite surfing or snorkeling. 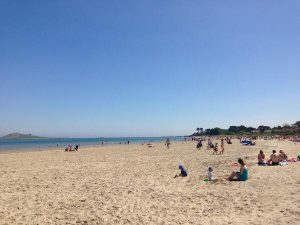 In this post you will get to know the best beaches around Dublin and how to get there as well as special things you can enjoy there. Moreover, all of the beaches have a beautiful view of Dublin Bay or the mountains surrounding Dublin. 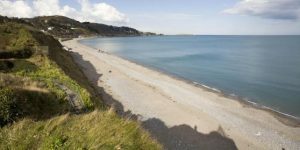 The beach in Killiney is a blue flag beach and that means that is has very clean water and also a clean beach. It´s 800m in length and the beach is mostly marked with stone-ridden sand, so it’s probably better for swimming. You will have a beautiful view of the Bray Head, the Sorrento Terrace and even the Sugar Loaf, a big mountain in the Dublin area. Especially the White Rock part of the beach is nice. Killiney is located in the south of Dublin and south of Dún Laoghaire. You can get there with the DART and you have to go to Killiney train station. Also known as “Dollier” this is the perfect beach for kite surfers. It´s 5km long and a mostly sandy beach. Other activities are jogging, walking, stand-up paddling or just enjoying your beach day out there. Furthermore, you have a nice view of Dublin Bay, Howth and Dún Laoghaire as well as some good bars and bistros on the seafront. The beach is located on Bulls Island, an island nature reserve in Clontarf. The best way to get there is the 130 bus to Clontarf Rd., Seaview Point. Just go over the wooden bridge afterwards and you’re at this amazing beach. This one is also a blue flag beach and 5km long in total. The beach is sandy and perfect for a nice long walk, a swim, a beach day with your friends, surfing or beach volleyball. You will have a stunning view of the Dublin Mountains and Howth harbour. The beach is in Portmansrock which is north of Howth. Just take the 32b or the 42 bus to Portmansrock and you are there. 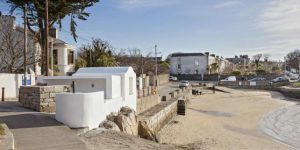 The beach in Sandycove is quite small so it’s packed on sunny days, but nevertheless it’s a beautiful little spot in Sandycove. It´s a sandy beach or there are just rocks like in the famous spot Forty Foot. Forty Foot is one of the most famous spots in Ireland to go for a swim, but you can also enjoy some diving and snorkeling at the beach. Moreover, you have some gorgeous views from there, for example of the Martello Tower. You can get there with the 59 bus from Dún Laoghaire or just hop on the DART and go to the station Sandycove & Glasthule. This 1.3km long sandy beach was awarded with the Green Coast Award 2017. It’s perfect for a day at the beach or for a nice walk. It also has a beautiful Martello Tower nearby. You will have a fantastic view of Ireland’s Eye, a small island in the Irish sea, too. Burrow Beach is in Sutton near Howth. Take the 31, 31a or 31b bus to get there or take the DART to Sutton station. This sand and shingle beach is 1.6km long and also a blue flag beach. It’s perfect for a swim or a walk and it has a beautiful promenade next to it as well. If that is to boring for you, you can visit the Sea Life right next to it. You can get to Bray with the 145 bus or you take the DART to Bray. 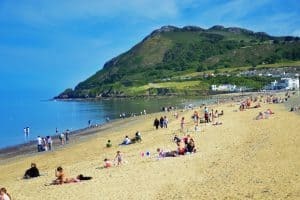 I hope you enjoy a sunny day at on of these beaches in the area around Dublin! !